Dear Grandma, I Want to go Fishing! I dedicate this webpage to Beverly Ludwigson, my grandmother and friend. At a young age, she brought me fishing for the first time. 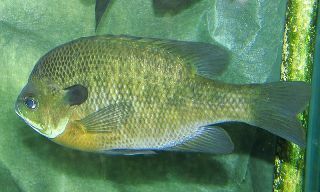 I had a smile on my face from ear to ear when I caught my first fish, a bluegill. Moments like this one made me become enthralled with the natural world. My grandmother's ability to fish is not her most amazing quality. She puts her heart and soul into making this world a better place for others. She is selfless and has spent hours volunteering. For these reasons, I could think of no other person who deserves a dedication on a webpage about bluegills.